In The HDCP 2.2 Authentication Process – an Introduction, we discussed why we need HDCP, and the basic steps of the HDCP Authentication Process. We noted that an advanced version of RSA is the underlying cryptography standard used during the Authentication and key exchange. 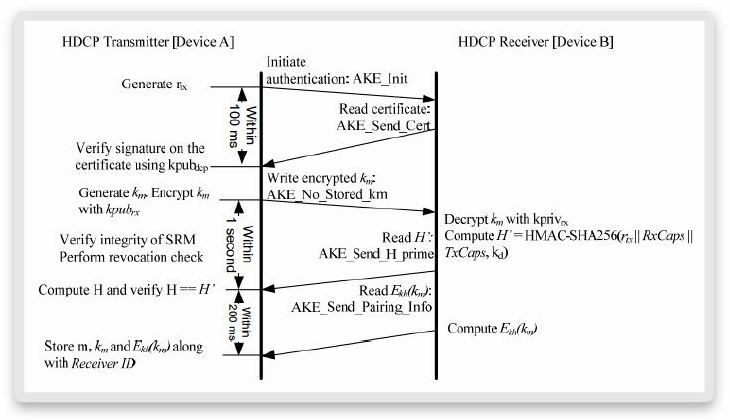 In HDCP 2.2 Authentication: RSA Cryptography, we discussed the basics of RSA Cryptography. In this blog post, we will dive into the details of Authentication and Key Exchange (AKE), which is the first step in the authentication protocol. You can learn more about the HDCP 2.2 Authentication Process by downloading our whitepaper, Demystifying the HDCP 2.2 Authentication Process. The HDCP transmitter can start at any time even before a previous authentication is complete. HDCP Receiver’s public key Certificate is verified by the HDCP transmitter then the devices share a master key Km. This stored master Key Km accelerates the subsequent communication between HDCP transmitter and Receiver. Authentication also happens even if the transmitter doesn’t have a stored master Key corresponding to the HDCP receiver. These keys information are sent in form of messages. If we are using HDMI then these messages would go over the I2C based control bus in big endian format. After successful signature verification, if the transmitter doesn’t have the stored master key Km from the previous session, the transmitter generates a random 128 bit master key, encrypts it using the RSAES-OAESP encryption with receiver’s public key, and sends it to the receiver. In addition to signature verification, the transmitter also checks that the receiver ID of the receiver is not present in the revocation list. It is a procedure to make sure that a receiver which has been compromised and identified will be tracked during authentication. If the receiver ID is found in the revocation list, AKE is aborted. Upon receiving the encrypted Km, receiver decrypt it using the receiver private key (HDCP2.2 recommend using Chinese Remainder theorem to reduce effort as this is the most compute intensive step in the entire authentication flow). There is also a time limit bound of 1s for the entire decryption and the subsequent hash value calculation. After the receiver successfully decrypts the km, it sends back the H_Prime, a HMAC-SHA-256 (see below section for details), hash value of the master key Km to the transmitter. This is to provide an acknowledgement to the transmitter that the receiver has indeed successfully decrypt the master Key Km. Upon receiving the Hash value (H_prime) from the receiver, the transmitter checks against its own computed value. Upon successful comparison of the H_Prime, Authentication and key exchange is complete otherwise AKE is aborted. In order to provide more authenticity for messages, HDCP2.2 uses Hash based Message Authenticity code(HMAC). The HMAC-SHA256 is a message authentication method which uses the underlying hash functions as SHA-256. The input to the HMAC-SHA256 is a key (which can be message). The output is the message access code which can be send back to originator of the message which can check the HMAC code against its own code and verify the message has been correctly received by the receiver. You can learn more about the HDCP 2.2 Authentication Process by downloading our whitepaper, Demystifying the HDCP 2.2 Authentication Process. This post is filed under HDCP, HDMI, Methodology.